The Down with the Crown Committee hopes to come up with creative events to help promote Hallowell businesses during next year's Water Street reconstruction. HALLOWELL — Three city groups held an informational meeting to update residents and talk about plans to help downtown businesses during next year’s Water Street reconstruction project. The Down with the Crown Committee — named for the crown in the road that will be removed during construction — the Hallowell Board of Trade and the Hallowell Arts and Cultural Committee want to make sure every business in Hallowell survives the six-month construction period from next April to October. Nearly 20 people, including members of the City Council and the Planning Board, attended the meeting and discussed ways to help minimize the effect the reconstruction project has on downtown businesses. The Maine Department of Transportation plans to update residents on the nearly $5 million project’s timeline during a meeting Wednesday. Since the Water Street project was announced, downtown business owners have expressed concern about what the disruption and potential loss of vehicle traffic would mean for their businesses. Several business owners even said that their businesses might not survive the reconstruction project. 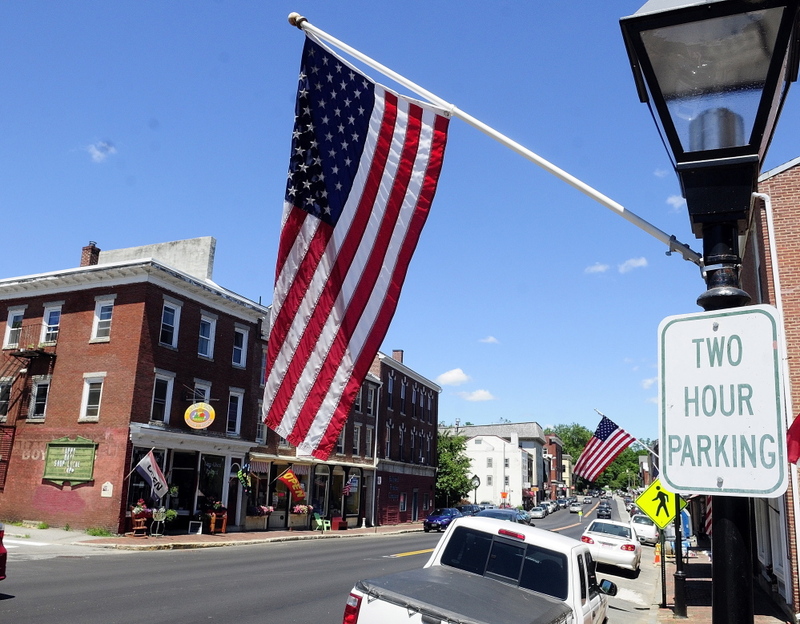 The Hallowell Board of Trade, an organization made up of business owners and residents, has been thinking for years about ways to keep people coming to Hallowell during the road work. The DOT plans to rebuild an approximately 2,000-square-foot stretch of the busy corridor beginning in April. “We’ve had two sessions where we’ve been gathering ideas,” said Deb Fahy, one of the group’s leaders. One of the big ideas is an opening ceremony party before the reconstruction begins. Chris Vallee, a part-owner of the Quarry Tap Room and the Board of Trade president, said he’d like to have all living former Hallowell mayors be honored at the opening event. The other big event before the project starts in April is one that has been discussed for years — painting the street. Fahy said the hope is to have a kickoff party the weekend before the project begins at which contractors, DOT officials, the city staff, local artists and whoever else will come and paint and draw on Water Street before it gets torn apart. Vallee also hopes there will be a water taxi from Gardiner to Augusta that’ll stop in Hallowell every 30 minutes. It’s unclear how that would work or who would run the vessel, but he said there is some time to figure out those details. Hallowell historian Sam Webber has offered to lead tours of historic Hallowell, and there has been talk of doing archaeological digs, because Webber said there’s a lot of history under the road. The group started a fundraising account to raise money to put on these events, to market the organization and to market Hallowell during the reconstruction. Group leaders are hoping to sell fundraising bricks and are working with other members of the Board of Trade and arts committee to come up with other creative ideas to raise money. To handle all the planning and brainstorming, the umbrella organization created a marketing, social media and communications committee charged with decorating store fronts and updating the group’s Facebook page; a logistics committee to encourage parking away from downtown and to hang “open for business” banners; a funding committee to sell bumper stickers and T-shirts; an education committee to plan waterfront tours and archaeological digs under Water Street; an arts committee to run a street party and poetry, sculpture and construction songs contest; and an events and community committee that will name the “crown prince and princess” of Hallowell and an opening and closing construction ceremony. The group plans to have several more large meetings in addition to the subcommittee meetings before the project starts next year. More information, including details about the goals and ideas of each committee, are available on the Board of Trade’s website.